This is a guest post collectively written by the XFR Collective (pronounced “transfer collective”), a grass-roots digitization and digital-preservation organization. They work with artists and media creators to rescue and preserve digital works, utilizing open, free platforms — such as the Internet Archive — for long-term preservation and access. We featured them in two previous Signal posts, May 12, 2014 and July 29, 2014. 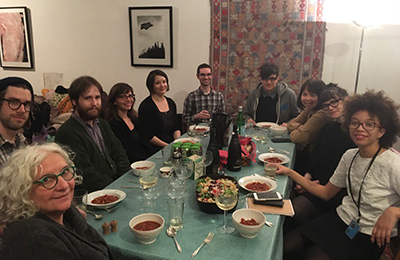 Some members of the XFR Collective in 2016. Photo by Yvonne Ng. This year, XFR Collective is expanding its efforts to develop and make available a reproducible community archiving training and access model. We recognize that XFR’s resources alone will not be enough to provide low-cost services to all those in possession of potentially deteriorating media that falls outside of the attention of large collecting institutions. The model we are developing will be constructed in a way that enables individuals and groups with little-to-no technical or archival expertise to easily understand core principles behind audio/visual transfer technology, determine a preservation strategy within their own means and implement it quickly. Creating an effective training model is a challenge and developing communities around preservation requires familiarity with a range of ideas and practices that fall outside the scope of traditional archival practice. XFR members, for instance, draw on tenets of community organizing, critical pedagogy, inter-sectional feminism and non-hierarchical ways of working in collaboration. In the spirit of community building and collaborative knowledge, we would like to share a few lessons we learned in 2016 and how they will steer the direction of our collective framework in 2017. Participants introduce themselves, describe their collections and needs. XFR presents a slideshow on the basic tenets of archival theory. XFR presents a tutorial on using Google Forms to collect descriptive metadata. XFR walks through the process of entering data into a form. XFR Collective member, Yvonne Ng at the AAOHC workshop. Photo by Rachel Mattson. We realized that much of what we prepared – mainly, core principles of archival and preservation theory presented in an hour – can inadvertently alienate audiences with limited means and resources. We discovered this during the Q&A period, which turned into an engaging discussion about the participants’ hopes and anxieties for their collections in the face of what often feels like an insurmountable task. We learned that for future workshops we need to designate more time upfront to allow participants to articulate their needs. 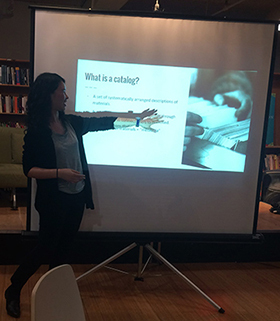 From there, workshop hosts and participants can work together to find the best path toward making decisions about their archival collections. Participants answer: What do I have? What do I need or want to come from this collection? Participants are invited to a follow-up workshop where tailored solutions are presented. In recent blog posts, some XFR members have explored the broader issue of changing how archival concepts are communicated. Check out Ethan Gates’s reflection on how conversation is the best way towards solving highly technical problems and Rachel Mattson’s takeaways from time spent at two national conferences that inspired her to re-imagine alternative archival-community centered frameworks. 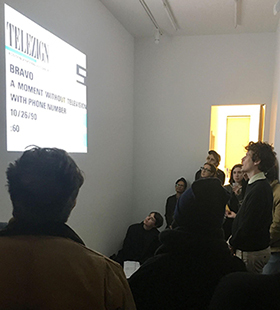 From a screening of “XFR Collective Selects: As Seen on TV” at Ulterior Gallery on January 6, 2017. Photo by Mary Kidd. In addition to leading workshops, we organize public screenings of transferred material, followed by a post-screening discussion with the audience to build awareness of matters related to media archiving. Preservation measures can be sustained by engaging the public, who in turn may find renewed value and meaning in resurrected analog works. We will continue to plan these events in order to bring greater public visibility to our partners’ works, foster a historical/intergenerational sense of community in a shared space and highlight the output of our efforts as a collective. In the latter half of 2016, we began migrating our workflow documentation onto the open-source platform Github. This has enabled us to further connect with virtual communities, gain their valuable input on our processes and share those processes with those looking to learn and/or adapt them. Prior to this we maintained internal documentation in our Google Drive and shared our documents only with those who knew to ask, which was an obstacle to making our workflows as accessible as possible. Adopting Github as our documentation platform also opens up a learning and teaching opportunity by and for XFR members. We, as a collective, are always looking to grow and share our skills so that we can refine and re-imagine how we approach community archiving. This feeds the idea of what we like to call “horizontal mentorship,” a concept that fosters non-hierarchical knowledge sharing. XFR Collective is just one relatively new model of a community archiving effort that arose out of the needs of the specific communities we are a part of and serve. There are other a/v-centric groups such as the Community Archiving Workshop, Moving Image Preservation of Puget Sound, the Canadian Lesbian and Gay Archive, the Memory Lab at the Washington D.C. Public Library and the Personal Archiving Lab at the Madison Public Library – just to name a few – who are working to provide similar services. Their existence demonstrates that the issue of unaffordable audio/visual transfer services extends across borders but also creates an incredible opportunity for these groups to share their experiences and create new learning networks. Our dream is to provide the tools that support individuals and communities in working with one another to care for their media by sharing documentation and workflows, workshop syllabi, conference presentation notes, and other resources on a variety of social media and learning platforms. By sharing our experiences and lessons learned, we hope to highlight the idea that personal archiving challenges are collective archiving challenges. What are some ways that you have addressed or overcome personal archiving obstacles? Please share in the comments! This is a syndicated post. Read the original at The Signal 2017-01-26.